Vibrant street art adds color to DC in any season. Just check out these colorful murals blanketing the city’s walls! DC’s art galleries are certainly some of the best places to explore masterful works of art. But DC’s color palette is not confined to museums or its bounty of natural beauty. The city’s neighborhood walls are covered with vibrant and unique murals, celebrating everything from hometown heroes to Founding Fathers and even fruit – there are literally hundreds of outdoor artworks and street murals to behold! We picked out just a handful of the most color-popping, popular works for an instantly ‘grammable street mural tour through the nation's capital. Before you dive into must-see street art, tag along with mural artist Aniekan Udofia – famed for his alleyway opus adorning the wall of local institution Ben’s Chili Bowl – as he unveils where he finds his inspiration in DC. Home to the Southwest Arts Club, Blind Whino is a former Baptist Church that has been transformed into a brightly colored arts and culture community center and gallery space near the Southwest Waterfront. Built in 1886, the Victorian and Romanesque architectural gem was re-imagined in October 2012 by artist HENSE and later repurposed as Blind Whino in 2013. Grab a gram out front and then head inside for a $5 jazz and blues concert Friday nights or a free yoga class! A DC staple since it opened in 1958, Ben’s Chili Bowl remains a must-visit for tourists, locals and celebrities. Known for its half-smoke – a DC delicacy that is half-pork, half-beef and served with heaping helpings of herbs, onion and chili sauce – Ben’s is also famous for its iconic building. The restaurant’s U Street location features a gigantic mural, updated in 2017 to include iconic African American figures, including DC-native Dave Chappelle, abolitionist Harriet Tubman and Barack and Michelle Obama. Step back for a wide-angled shot of the whole mural or get up close and personal for a selfie with one of the wall’s icons. For a more traditional portrait of the country’s first president, head to National Portrait Gallery. But if you’re looking to see George Washington funk-a-fied, look no further than artist MADSTEEZ’s piece in NoMa. The mural is part of an international art movement, POW! WOW!, which celebrates culture, music and art all over the world. 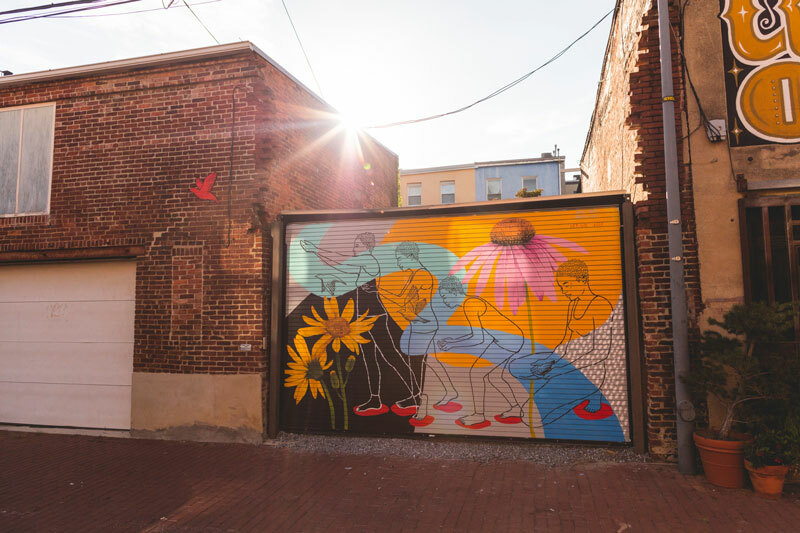 Tucked amongst rehabbed carriage-houses and Shaw's award-winning restaurants like The Dabney, Blagden Alley was once home to working class African Americans following the Civil War and, later, creators in DC’s underground art scene. Now you’ll find a series of rotating murals including an oversized tribute to musicians Sun Ra and Erykah Badu and this piece, titled, “Let.Go.” by artist Rose Jaffe. The Columbia Heights neighborhood is full of street art celebrating the area’s culture and diversity. “My Culture, Mi Gente,” by artist Joel Bergner is just one such mural. The colorful artwork can be found across from the Columbia Heights Metro Station. Union Market is your one-stop shop for mural grams! The revitalized NoMa food hall has something for everyone; there’s the heart wall topped with the inspiring message, “Never Give Up,” a project by LA-based graffiti artist Mr. Brainwash in honor of International Women’s Day in 2015. If minimalism is your thing, stand across the street at Brentwood Park to capture the building’s latest masterpiece by Yoko Ono, commissioned as a part of Hirshhorn in the City. 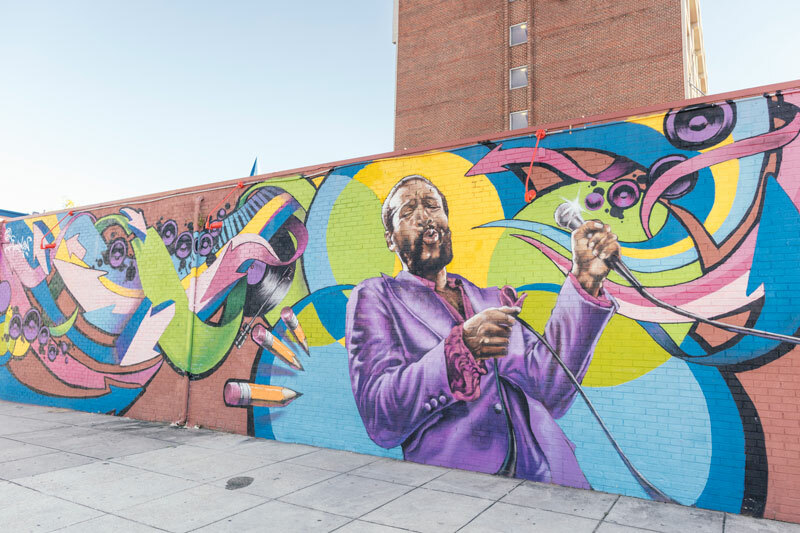 Artist Aneikan Udofo, who is the creative mind behind the Ben’s mural and Blagden Alley’s whimsical portrait of Sun Ra and Erykah Badu, pays tribute to DC-born musician Marvin Gaye in this masterpiece in Shaw. The vibrant mural is Udofo’s second of the soulful icon – the previous mural was created in 2013 but later covered by construction. Plastered on the side of a residence in Logan Circle, the Watermelon House is a must-see on your mural tour of DC. The story behind the Watermelon House goes something like this: the owners of the home hired someone to paint the side red but when the result was more pink than anticipated, the owners turned lemons into watermelon. The home has become an attraction for visitors and locals alike, even sparking its own Instagram account, @watermelonjumps, which, as the name suggests, consists of people jumping in front of the juicy wall. A hip, dog-friendly brewtopia and cafe, Shaw’s Dacha Beer Garden also boasts some of the city’s most recognizable street art – a giant mural of glamorous 20th-century movie star, Elizabeth Taylor. Raise a glass (or one of the eatery’s monster pretzels) to the icon for the perfect foodie-gram.